WB6BNQ, and K7HIL continue their streak of "zero error" readings, with W8XN joining in this week. I have to say pretty impressive considering the 20 KHz delta. Lots of close readings continue to point to the fact that a reference signal can be use to great advantage. It will be interesting to see if we will see a gradual loss of correlation or there might be a sharp knee as we continue to a higher delta. Take a look near the bottom of the page, at the pdf from K7HIL, and the spectrograph from W3JW. Assuming various transmitter problems can be solved, the next planned delta will be 200 KHz. K7HIL AZ DM42ph 14140003.754 14140003.754 0.000 0.00E+00 Was able to reduce three antenna directions. Average was 14,140,003.753998. Individual measurements were ESE=14,140,003.753881, WNW=14,140,003.754092 and S=14,140,003.754020. Apparent Doppler was worst seen yet, variations of up to 300 mHz and was pleasantly surprised after reducing the data. Great job Connie, appreciate all the effort you are making. WB6BNQ SDG DM12 14140003.754 14140003.754 0.000 0.00E+00 To do the 20KHz spacing had to use my IC-765ProII and main computer which have no temperature or frequency stability. Based upon the recorded error differences from Sunday and Monday’s tests, I applied a correction factor of 14 milli-hertz to my derived 14,140,003.740 from Wednesday’s run for the reported value. The only usable part of the run was the last, i.e., South direction signal. W8XN MI EN82DG 14140003.754 14140003.754 0.000 0.00E+00 I let the computer guess the frequency this time -- no human intervention -- so I could be way off. Large Doppler spread with very ragged looking peaks, but near zero shift over my averaging time. Thanks for another fun test, Connie. On to 200 kHz! NF6Z-W NV DM26 14140003.754 14140003.752 -0.003 1.77E-10 Recorded n USRP controlled with gnuradio companion. Programmed a receiver with 2 channels separated by 20kHz. Looked at delta-f between the two. Got much more variation than at 2kHz separation. Averaged over interval when separation was nearly constant. W3JW-ENE VA FM17TN 14140003.754 14140003.757 0.003 2.12E-10 The data from the ENE run was my second best data set. There was a significant amount of doppler shift during this run however. The traces look like a snake. They have high level of correlation though. W3JW-ESE VA FM17TN 14140003.754 14140003.757 0.003 2.12E-10 The ESE transmission produced the "Best" data at this QTH. This result is the average of all data points produced by the SL export file tool during the ESE portion of the test. There was a noticable amount of "wiggle" in the waterfall trace. Tnx fer the gud test. NF6Z-ESE NV DM26 14140003.754 14140003.763 0.009 6.58E-10 Same as NF6Z-W. This one was pointing away from me. Much better signal than those near 90 degrees. ve3dnl_run3 ON FN03 14140003.754 14140003.743 -0.011 7.78E-10 Run 3 at about 10:08 p.m. EDT. Signals are a little weak, but still decent SNR. 22050.02 s/s. 262144 FFT, no decimation. Average of about ten FFTs with 50 % overlap. ve3dnl_run2 ON FN03 14140003.754 14140003.740 -0.014 9.90E-10 This is second run @ 10:05 p.m. EDT. Strongest signal of all the runs. Still am not confident in Spectrum Lab's peak-finding setup. 22050.02 s/s . 262144 FFT, no decimation. Average of about 15 FFT's. Used 14120000.0 as a reference for lower peak. I have no locked, stable references (yet). ve3dnl_run1 ON FN03 14140003.754 14140003.721 -0.033 2.33E-09 From first run @ 10:00 p.m. EDT. Receiver is direct conversion homebrew with 25 Khz. bandwidth. L.O. placed at 14.13 Mhz. Two audio peaks near 10Khz. processed by SpectrumLab. Am not confident that soundcard is calibrated, or that peak-finding is accurate. Have WAV recorded files. K6BZZ AZ DM33xb 14140003.754 14140003.809 0.055 3.89E-09 WNW strong, W stronger. Reading from W. Hetrodyne method.It gets more and more interesting, hi. Thanks Connie. KM6QX-W EB CM87 14140003.754 14140003.699 -0.055 3.89E-09 Delta-F didn't work out with the Flex-1500 MultiRX VFO-B, so this guess is a single frequency measurement with SpecLab. I picked a somewhat consistant peak about 10 dB below the main smear of Doppler shifted signals. This peak, measured on the W run, did not appear on the NNW run. N4AU AL EM62vp 14140003.754 14140003.840 0.086 6.08E-09 ESE signal weak and in local noise. Used Spec Lab and made guess. N4AU ESE AL EM62vp 14140003.754 14140003.840 0.086 6.08E-09 Weak signal in local noise. Made a guess using Spec Lab and spread sheet. Measured the REF signal, then the Unknown and calculated the difference. N4AU AL EM62vp 14140003.754 14140003.640 -0.114 8.06E-09 ESE signal very weak and in the local noise. Lot of guessing here. Used SpecLab and spreadsheet calcs. N4AU S AL EM62vp 14140003.754 14140003.639 -0.115 8.13E-09 Slightly better signal in local noise. Made a guess using Spec Lab and spread sheet. Measured the REF signal, then the Unknown and calculated the difference. Considerable difference in the S and ESE signals. W6OQI LAX DM04vf 14140003.754 14140003.536 -0.218 1.54E-08 Doppler was the least when K5CM beamed East and South. K5CM beaming West had the strongest signal and the most Doppler. It was as if the frequency changed when K5CM beamed south, 14140003.428 Hz compared to 14140003.536 Hz while beaming East. I measured the pilot signal but did not use it in my calculations. N05K-S STX EM10cm 14140003.754 14140003.305 -0.449 3.18E-08 The usual poor signals and High Noise level here, a real antenna would help. The SSB in the middle was interesting, no problem just 20 dB stronger than FMT. I think this entry is for 'South' it was at the end and 2-6 db over the NF. This time I used the 1500, John's DBM method and included a small amp, narrow BPF and LPF. Sure looks/works great with two sig gens! FMT Signals I could see were in the noise and usualy moving Hz. Thanks for the effort. K6IQL KS EM28nq 14140003.754 14140003.267 -0.487 3.44E-08 Did not use 14.120 reference. Submitted Data is NNE based upon a measurement of unknown frequency only. Noted WNW to be higher in frequency by perhaps 200 mHz, but did not use that info in arriving at my solution. Solution based upon straight numerical data reduction. Crystal Ball battery dead. Thanks Connie -73 john k6iql. KG0HY NE EN20 14140003.754 14120000.000 Signals were -110db, with a slight echo. Used a WinRadio G313 and a HF vertical. Spectrum Lab was showing a steady tone on all six transmissions. This from Jeff, W3JW. A 20 KHz delta practice run. 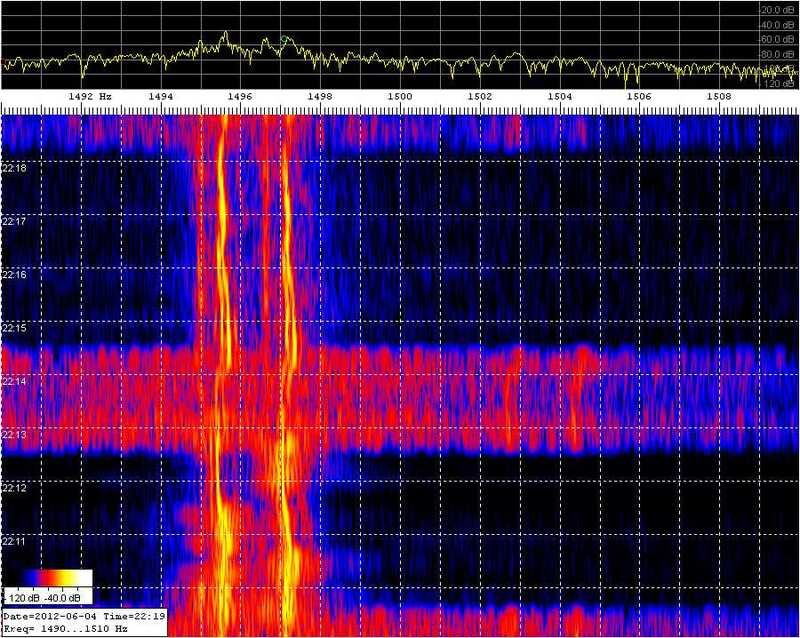 Despite the noise, notice the correlation in the two signals which are 20 KHz apart. A HP Z3801 GPS frequency source clocks a HP-3336B and a PTS-250. The outputs are combined and feed to a 10 db transistor amp which drives a 12BY7 / pair 6146. Then to the final amplifier, a Dentron 2500 running 300 watts out. Each signal was first set to 150 watts out. There are no mixers or any device in the chain of amplifiers that might impact the accuracy of the GPS frequency source. As a reality check, I periodically log the frequency source against WWV and other GPS referenced sources. I monitor each transmission with a completely separate receive system to look for any instability or short term drift.